For once, Howard Fields feels happy with his writing. The opening of his blog post flows nicely. The tips are solid, and he’s finally got to grips with tightening his own content. Even the rhythm sounds good. Is he finding his voice? Howard’s mind wanders back to last night’s dinner at Ning. The sweet spiciness of the soft-shell crabs still lingers in his mouth. He licks his lips, remembering the tingling feeling and the aromatic mix of exotic spices. Lemongrass. Ginger. Chillies. And what else? Suddenly, Howard realizes what’s missing from his post … an ending so good that it sings around in his readers’ minds. A lingering reminder to implement his advice. But how can he write such an ending? What makes closing paragraphs inspirational? Many bloggers don’t write a final paragraph. They share their tips, and that’s it. Their content peters out. But as bloggers, our task is not simply to share tips, but to encourage our readers, to make them feel good, to spark action … to be a good mentor. How does a mentor inspire? Start with imagining your favorite reader. What’s stopping him from implementing your advice? Does he feel overwhelmed? Does he think he can’t do it? Does he feel it’s too much effort for too little gain? When you understand what’s holding your favorite reader back, you can help him with specific advice. Give a pep talk or remind him of the benefits of implementing your advice. Imagine a long list post with 18 writing tips. Would readers feel overwhelmed? Would they remember anything? A simple way to write your final lines is to repeat the essence of your message—the one thing you want your readers to remember. Blogging isn’t about hitting the publish button. You’re starting a conversation with your readers. To have a good chat, you need to listen more than you talk. Learn who your readers are. Understand their struggles. Know their frustrations. Treat your readers even better than you would treat a friend. Help them overcome their doubts and their fears. Encourage them to realize their dreams. Captivate them. Seduce them. Enchant them. A circle is a simple closed shape; it’s balanced. So circling back to your introduction gives your writing a finished and balanced feel. Communicate a powerful image in your opening paragraph, and go back to this image in your closing lines. For Copyblogger, I wrote a post about vivid writing, and the opening paragraph talks about your message standing out like a red poppy in a sea of grey content. You and I both know that change is hard. How can we encourage our readers to roll up their sleeves and implement our tips? Tell them why they should care. How will their efforts pay off? How will they feel better? Do you ever think back to a conversation you had with a friend? Do you hear her voice in your head? That’s how readers should experience your content. Let your words linger in their minds. Inspire them long after they’ve read your words. In a world of endless pixels and meaningless likes, we crave human connections and voices that resonate with us. So, be yourself. Brew a cup of green tea. Offer your readers a slice of homemade cake. And have a cozy chat. Sometimes, we ask the nearly impossible from our readers. Because a big obstacle sabotages their efforts to implement our advice. Obstacles like self-doubt, feeling overwhelmed, or being totally stressed out. You may even feel intimidated by others bragging about their huge followings, their launch successes, and the amount of money they’re making. But remember, everyone starts at zero. Zero followers. Zero subscribers. Zero profit. You may doubt whether you’re able to pull this off. Even people like Neil Gaiman, Sheryl Sandberg, Sonia Sotomayor, and Emma Watson feel like a fraud sometimes. Nobody is perfect. Nobody knows everything. And nobody possesses the perfect blueprint. We all stumble around from time to time. So pick up the courage to get started. As a blogger, you position yourself as a voice of authority. But the problem with authority is that it creates a distance between you and your readers. Readers might think … she can do it, she’s an authority. But I can’t. I’m not good enough. A good blogger understands the beauty of language, and how to use words for maximum impact. But choosing the right words is a superficial form of beauty. The real beauty comes from within … a willingness to help, to be honest and generous. A spirited drive to share your ideas. A real sense of human connection. The real beauty of writing comes from a deep understanding of your readers, and a desire to spark change, no matter how tiny. Hello Henneke, I totally agree with you, most blogs I have gone through lack a crisp ending. All the insights they wish to deliver won’t linger with the end para or there won’t be an end para at all. As you mentioned, a well-structured and inspiring ending helps in reinforcing the message you intend to deliver. Each blogger should keep in mind that through his blog he is taking the target audience for a journey, a journey that provides useful information for their target audience. It is always better to end the journey in the best way possible, that they feel emotionally attached to you. Thank you for the good read. I appreciate your comment, Deebak. Thank you for stopping by. The way you write emphasizes one bold point. You know your ideal reader. I can assume it to be true for all persuasive writing. I love, love, love the image of a circle, of circling back to your introduction. I just looked at something I wrote and the ending had landed in the completely wrong place. I think it looked more like a broken triangle. LOL! I also think your analogy of stumbling around is wonderful, and the examples of people who have felt like frauds. Although we’d like to think differently, we’re stumbling around most of the time…the trick is to learn to embrace the stumble! 🙂 Great post! When others achieve great things, it seems to come to them so easy. But then I have to tell myself every time … I don’t know what’s gone on behind the scenes; I have no clue how much effort went into that and how many mistakes have been smoothed over and patched up. That is so true. Success always looks easy after it’s happened. And kids aren’t thinking about “success”. Thank you for your lovely comment, Julian. I appreciate it! To be honest, I have mostly been lazy with the ending paragraphs of my articles. I never thought they are so important. But, your point that ‘as writers, our job is not only to share tips but also to comfort our audience, inspire action……’ sounds quite convincing. Thank you for your lovely compliment, Samiskha. I appreciate it! I know my endings are never that good, but I’m going to go back and rework them using these principles. Having examples makes it so much easier to know what you mean! A while back someone asked me whether I find opening or closing paragraphs more difficult to write. At that time, I sat on the fence and replied that both have their challenges. But now I’ve written this post, I actually think closing paragraphs are more difficult. Thank you for your lovely comment, Claire. Drop me an email when you’ve published your post? I have a question, I’m hoping the answer is obvious: how do you decide how long your closing paragraph should be? If I look at your examples above, they are all excellent (of course!) and they are all longer than I customarily make my closings (when I am not too, a-hem, lazy to do them at all). I’ve looked for a formula of sorts, but I can’t see one. I do see that you use powerful language devices, and the flow of the paragraph is really natural. But I think I would tend to leave quite a lot out and end up finishing them prematurely. Do you have any advice on how to make them Goldilocks-right? The “ideal” length of the closing paragraph is related to the overall length of the blog post, but I’m sure quite a lot of variation exists. My rule of thumb is that the closing paragraph is about 10% of the total word count. But when I checked it, they’re usually a little shorter than that (more around 7 – 8%). The example paragraphs in this article are all from guest posts, which tend to be a bit longer than my own posts. The closing paragraphs on Enchanting Marketing tend to be a little shorter than these. Great question, Alison. And thank you for that guideline, Henneke. For a blog post, to make it readable, a blogger should try the best from starting to the ending. The closing part influences your readers a lot. Summing up your whole points in a paragraph can be really catchy. Sometimes, people get bored to see many points. They try to find something easy to grab. If you’re the one with the writing skills then it’s going to be killer. Yep, I agree – the closing paragraph influences readers a lot. I’m glad you enjoyed this post, Ravi. Thank you for stopping by! Thank you for the inspiration, Henneke! Great having these tips in one place. ?? I agree, there’s an art to ending a blog post, Henneke. There’s nothing worse than one that just tapers off. For me, circling back to the beginning gives a satisfying feel like a sweet after a meal. Thanks for the great reminder. Yep, a sweet or how about some cheese for dessert? Good to see you again, Laurie. I’ve missed you! Henneke, I’ve followed you for quite some time now. I think it’s time I checked out your courses. Your emails are an inspiration, and your posts are always invaluable. Do you have a writing course for an intermediate-level blogger? Or can you recommend one from any other coach who you believe can bring out the best in me? Thank you so much for referring us to your work away from Enchanted Marketing. I first found you with your first guest post from Copyblogger. I eagerly followed your guest blogging adventures even before you went live with your own blog. And boy, did you have adventures! Quite an impressive list of site to guest posting. Now that your own business is well-established. You still find time to post for Copyblogger and SmartBlogger (fmrly Boost Blog Traffic). Just watching your choices is an education for me. Closing paragraphs are something I always struggle with. With your suggestions and examples in hand, I returned to my recent post and tweaked the ending to hopefully lead the reader to take action. Thanks so much for this helpful post, Henneke! I love to hear that, Marie! About closing paragraphs, I can say without a doubt that they are very, very and extremely useful because I think that you immediately you grab your reader’s attention, right? In my view, the closing paragraph is less about grabbing attention (that’s what your headline should do) and more about inspiring your reader to implement the advice you’ve shared in your post. 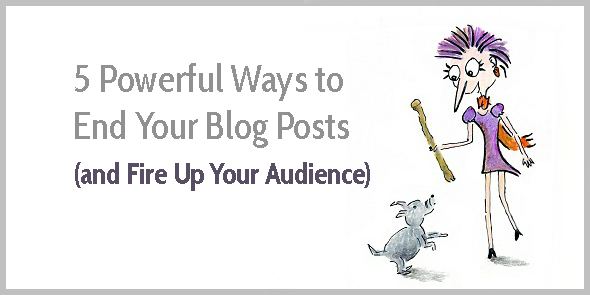 I make sure I put an effort to implement these tips each time I write a post. To me it feels like a post is complete whether I’m writing or reading when this is done for your conclusions. I feel that conclusions lead the reader to not only take action but also give then a reason to come back. It’s as if you’re saying “may the saga continue” or “to be continued…” in a sense. In this way it keeps them in suspense and causes them to mentally go back over what you just wrote. Thanks for the share Henneke! Have a good one! I’m sure a cliffhanger approach can also be used for a final paragraph. I’ve never tried it as I tend to write each blog post as a stand-alone piece of content. But that’s certainly not the only way to do it! I know – it’s hard to tick all the boxes! What helps me, is to write the final paragraph the next day or a couple of days later. Same for the title. I leave that one percolating at least overnight, too. Often a better idea strikes the next day. Happy writing, Mitch. Thank you for stopping by. However could you say the same thing in Dutch? That sentence has such a forlorn feeling to it, it makes you… wander over deserted, gloomy stretches of heath.. in the rain. And the wind. I was rereading your guest post on my blog again today, the one from 2013, as I am going over all of my content this week, and it struck me not only how good it was, but how alike our styles were at the time, when you wroite in Dutch. In English, however, you sound completely different. I wish I could see you pull of the same colourful, sensitive (in the meaning of catering to all the senses) type of writing in Dutch again, for once. That would be an interesting challenge (translating my current writing into Dutch). I tend to think my Dutch isn’t good enough anymore … But I might try it some time. Just to see whether it’d work. If you look at my writing in English from 2013, then it’s quite different from now, too. The rhythm is different and the word choice, too. I have not suffered from feeling as if I’m not a good writer, as some have done. I enjoy writing and love playing with words. But when you show us how to be better, I realize, I was self-deluded. I have the potential to be a good writer. And someday I will get there, I know. But I am so thankful for a good teacher like you. In the schools, we were told to write, not taught to write. I shall learn it, yet! Thanks for this lesson! And I think there are words in Dutch that would not translate to English, also. It’s that way in all languages, in translation. My mom was German, and she used a German word for a certain type of snow for which English has no word: a skif. That is, just a light, dry, blowing snow, as if it were flour strewn all over the highways, being blown by a cold dry wind. A LONG definition for such a short word: skif. I’m sure you’re shortchanging yourself. Your writing is better than you think. Everyone of us can always do better, but that’s what’s true for any skill. The Dutch word “gezellig” is difficult to translate into English. It’s something like cozy and can refer to an atmosphere or describe an interior. I have “circled back” to this blog post as I am writing the end to a “White Paper”. Thank you for your tips. That’s lovely to “hear,” Susan! Thank you. This was a great post. The ending is something i usually struggle with and I’m struggling (at times) to find my way to create a “perfect” ending. This post certainly gives me a lot of ideas of various things I can do to really drive my message home. I really like #2 and #4. Those are what I’m most familiar with but I have no issues with trying them all. I find writing endings tough, too. That’s why I usually write them the next day (the day after I drafted the main body of the post). I hope you’ll have fun trying these different ideas! More great writing advice. I never really know how to end my blog posts and they usually just end with “thanks for reading” and “please share this post”. I always thought I was supposed to end with a call to action, so that’s what I’ve done. But you’ve presented a different approach that feels better to me. It creates more of an emotional connection rather than a command to act. I like that. I’m going to try it with my next post. Yes, I’ve also seen people asking for comments at the end of the post, but it doesn’t seem to work particularly well. Encouraging people to act on my advice feels more natural to me. Thank you for stopping by again, Mary Ann. I appreciate it! Another valuable, tip for all sorts of writing, Henneke. I love this one so much I’ll leave it on my desktop. To check and re-read it over and over again. Just finished my last book in the children’s series and taking time to read for a change. Enjoying life with, little pressure, for a little while. Whatever age one is at, learning never ends. Love your blogs, <3 :-)A. Yes, you’re right. This tip also works outside blogging. Me gusta… me gusta ?? ?